Here we are, sandwiched between the release of Game of Thrones season 2 on DVD and Blu-ray and the imminent arrival of season 3 on our TV screens, with just enough time to catch up on the former ahead of the latter. Recently, our man Patrick spent a day in the company of many of the Game of Thrones cast, a plateful of chips and some posh sandwiches. He came back with hours of audio, which we’ve now picked through to pull out some of the most interesting bits. If we left it all in, you’d have been reading for a week at least. So, here we go. Here’s just some of what the Game of Thrones cast had to say to us. I think there’s different strands of female characters within the piece and depending on what part of that world they’re from they have certain traits. Some are born into intrigue and those make for very good politicians. In many ways the women have to be stronger and faster and cleverer than the men in order to survive to stay alive. With Catelyn, instead of being the matriarch of a castle, she now becomes a politician. She has to embrace that role as a means to an end, which for her is getting the family back together. Men need women in this show. You see it everywhere, from Little Finger and the whores to Cersei with Joffrey, and particularly with Robb and his mother in season two. Robb still needs his mother – and I think in many ways his mother needs Robb as well. Robb’s got his strategy down really well but at the end of it he still turns to his mother regularly and needs not just reassurance, but proper advice from a woman who understands politics a lot better than he does. The women need the men to fight the wars and the men need the women a lot of the time to help them win it. Well I think women in Game Of Thrones have a harder job because they exist in a man’s world, so the means by which they use to get what they want have to be highly skilled, they have to be dedicated to their execution. In the way that Brienne of Tarth has to push her capabilities beyond that of most men, I think that intellectually someone like Cersei has to be utterly strategic, precisely strategic, in order to get what she wants. I think the stakes are much higher for women. The women have to be more devious and more scheming than the men. Not just as much as, but more so, to get anywhere in the Seven Kingdoms, I think. Well, I think Game of Thrones is fantastic in its portrayal of female characters. I think it is a bit of a frontrunner for powerful and dominent women. Men answer to these women in the show. I think that is absolutely brilliant and it is wonderful to have a role where you can get your teeth into something and not just be two dimensional, to have all these layers to a character. Everywhere you look in Game of Thrones you have dominent women taking hold of the situation. The parallels are very clear actually. I think a lot of people have come to the show and stayed with it simply because the issues that the characters deal with are relevant and prevalent in life today. Survival, honesty, family, loss, grief, a woman’s role in society… and the way the world is falling apart at the moment. There are so many parallels. It’s under the umbrella of fantasy but the characters are real and real people can associate with their struggles. We’re in a mythical world. If it’s likened to anything it’s the medieval period, which was ruthless and cruel and feudal. And I think most of us have done a fair amount of history in our work and we know what that period is about. Even though this is mythical, that’s my terms of reference for this thing. And although there are a lot of pretty nasty things happening in the world now, we’re a lot more civilised than we were in the medieval period. This family, the Lannister family are at the height of power. I think even today if you want to be at the very top this kind of intrigue and drama comes with the territory. You have to make some very tough decisions and you have to be ruthless. It’s no different with the heads of the modern world. I had the best time in the world at Comic Con, I had so much fun there. It’s like a different world where so many people are keen and enthusiastic. We work so hard to put a show out and it can get criticised, or people don’t really care about it… and then you go somewhere where people not only care about it and watch it but really enjoy every aspect of it. That’s the nice pay off for all the work you’ve done, to see people enjoying it so much that they would come to Comic Con to listen to a panel or make an amazing costume and really get involved in it. It’s a great fun weekend and it’s really nice to see the show hitting people so powerfully. It’s incredibly humbling that this comes into other people’s lives, not just our own. We have a fantastic time filming it but it’s become really obvious that around the world people really love the show and that’s the best response you could ever wish for. I’ve only been to one, the Comic Con in San Diego just after season one came out. And I was just blown away. It was shocking and exhilarating and amazing… we met an enormous crowd of very passionate people who knew far more about the show than I did. They were genuinely thrilled for us to be there and how could you not like that? It’s just thrilling as an actor to have the opportunity to be in something really successful because, unfortunately, not many actors get to have that experience. I’m enormously grateful. Well, you’d have to ask Patrick if he was disappointed at all. I don’t think so, mind. 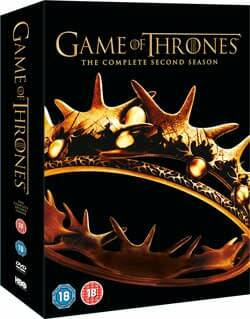 Game of Thrones season two, or for that matter season one, can be yours on DVD and Blu-ray now. The third season starts on March 31st in the US and April 1st in the UK.